Each year, we participate in the FIRST Robotics Challenge, where we have 6 weeks to design, code, and build a robot from scratch. Here's a showcase of past years' bots. 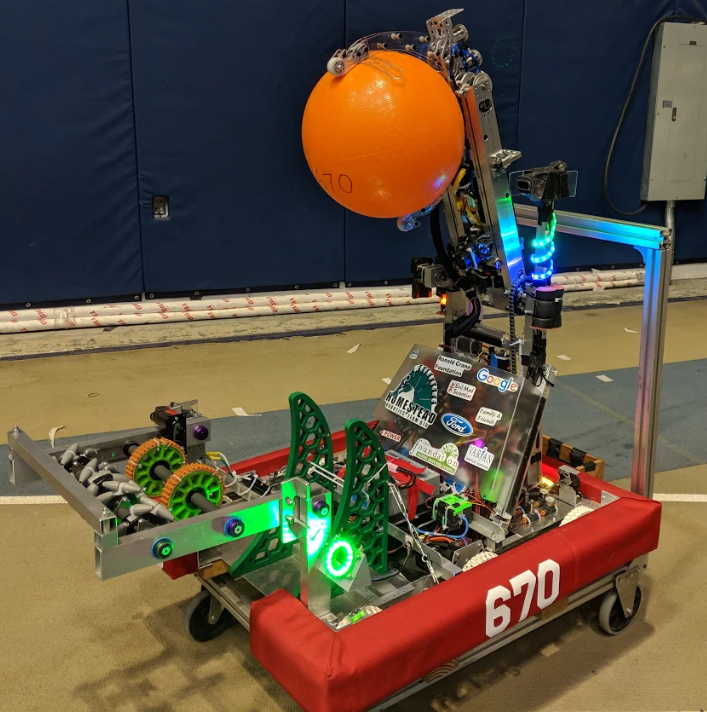 Destination: Deep Space, 2019: "The Flex"
"The Flex" competed at the Arizona North and Silicon Valley regionals. At Silicon Valley, it won the Industrial Design Award. Front- and back-facing cameras stream to the driver station, while our in-progress vision targeting system will allow the robot to pivot, align, and drive to a target. Our robot features 3-part arm capable of placing cargo and hatches in the front and back without having to turn the robot around. We can reach the cargo ship and the bottom 2 levels of the rocket. Smooth, consistent, and speedy cargo pickup using our intake, the claw, and an IR sensor. Robots from previous years - click on the images below to enlarge.